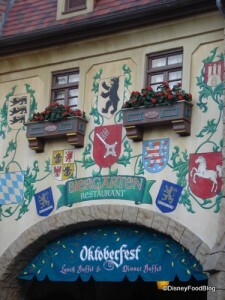 If you’re ready for an exciting, fun-filled meal, head over to Germany’s Biergarten and sit for a spell! The Biergarten is a theater-style restaurant filled with long, family-style tables. Up on stage, German performers showcase authentic Oktoberfest shows throughout the day — lederhosen and all! The Buffet menu includes your favorite German dishes, including bratwurst, spaetzle, and more. Don’t forget to wash it down with your favorite German beer! Rotating lunch and dinner selections consist of German favorites such as bratwurst, red cabbage sauerkraut, pork schnitzel and spaetzle. Seating is family-style, so unless you have a huge party, you’ll be seated with other people at your table. Kids are often welcomed onto the stage to jam with the German performers, so encourage your little one if you have a Disney star-in-the-making! DFB Video: Epcot’s Germany — Nosh or Not? Food Tour! New Video: Best Disney World Restaurants for the Whole Family! Disney Food (and Drink) Pics of the Week: Beer at Disney!